WHEN and HOW did I become more knowledgeable about Music History than Wikipedia? Definitely not more knowledgeable but maybe more ENTERTAINING? JSU students yell out questions in the hall, message me while they are at museums for more information, and dig for facts in class (well past simple text book facts). I am constantly challenged. Here’s how as a performance major I have held my ground and raised exams scores for students across the board. In college I was determined to SURVIVE the notoriously challenging curriculum of Indiana University. After class, others would go home and open their Burkholder-Grout text, relishing the reading. I would fall asleep. Note: it does NOT make a comfortable pillow. I’ve tested this as I’ve now read this book 5 times. 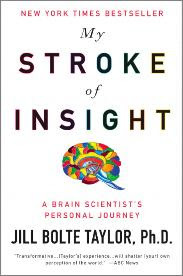 Luckily while in college I met and worked with Harvard Brain Scientist Dr. Jill Bolte Taylor. I would puppy sit for her while she did public speaking events. In exchange, she taught me about working with the right and left side of the brain while studying, aiding retention. She also helped me learn how to stay out of the amygdala. The part of the brain that is fight or flight. The prepubescent self. The part of the brain that can not access the right or left side of the brain. What I learned- most education only teaches to the left side of the brain. Read materials, discuss materials and then test on memorization of materials. Yawn! No wonder I was bored. Education (especially for artists) needs to allow for creativity and expression. By working with both sides of the brain I was entertained, present and my test scores became the highest in the class. I have seen the same effect when I teach with the same methodology. By using Familiar Pop Culture- materials become more Accessible and are put in a Historical Time Period as Colleagues. I strive to remove the intimidation factor of facts and dates by drawing memorable entertaining parallels. 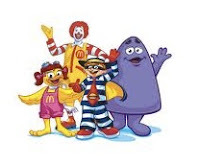 For example, Baroque Era composers are McDonald’s characters. Antonio Vivaldi is Ronald McDonald, both had red hair, had a love affair of shoes and both worked at a hospital for children. J.S. Bach and the ham burglar went to jail. Grimace and Handel both struggled with their weight. 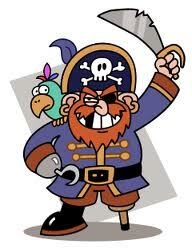 When we study the ARS Antiqua, ARS Nova, and ARS Subtilior we speak like pirates. “Arrr- shiver me timbers- it’s the Ars Nova!” The composer Guillaume de Machaut is drawn on the board as a pirate with a bird on his shoulder named Poly, making reference to the use of polyphonic music. And his peg leg notes the greater use of rhythmic syncopation. My drawings are purposefully not as artistic as this clip art. As I draw the students come alive as art critics. You won’t catch any of them texting, sleeping or zoning out. They are too busy asking why my birds are so fat, what Grimace really is, and taking pictures for their notes. The left brain is learning facts and the right brain is entertained. Often on exams when students can’t remember the answers I have them draw the pictures. As they draw they begin to remember the details of the materials. Most test taking anxiety occurs when one is in the amygdala. The only way out of the amygdala is to go into the right side of the brain through the breath. If the facts are only stored in the left side of the brain, the student the student will remain unable to access the answers. But if the students has learned the materials and stored them in both the right and left side they will begin to have success. By teaching both sides of the brain the material is always accessible, even when one is nervous. The last gem of wisdom I learned from Dr. Jill, excited and nervous are the same chemical in the brain. Shifting perceptions can dramatically alter the reality and calm the nerves. And when all else fails- breathe- it will open your creativity.